In this study nearly 15 cows with thorny like warts in the teats with different severity which hinder milking process and also annoyance to milk man and to owner. Goats 3 in numbers which have pedunculated raised bleeding warts present all over the body was also taken for this trail. 1.Easy to carry out at field level. 2.No need of centrifuging the raw blood & take serum for therapy. 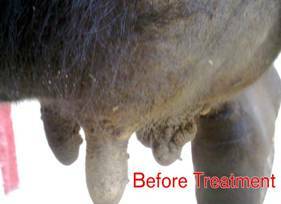 Based on the severity of warts all the cows were divided into Mild, Moderate and severe. 1. Thorny warts are few in numbers in the teats. 2.Take 30ml of raw blood (15ml in one syringe and another 15 ml in another syringe) from the jugular vein of the same cow using sterile disposable syringes. 3.Give 15ml of the blood intra muscularly immediately. 4.Give another 15ml of blood subcutaneously to the same cow. 5.Ask the owner to bring the cow next week on the same day. 6.On physical clinical examination you can see the 50% of the warts were sloughed off leaving whitish scar on that areas and the remaining showed dark blackish color indicating necrosis. 7.Now give the second injection of the same dose of blood on the same route. 8.Ask to bring the cow on third week. You can see all the warts were completely sloughed off. 1. The procedure is same but the dosage of blood is 40ml. 2. 20ml of blood I/M and 20ml of blood S/C. 4. You can see all the warts sloughed off after third week of treatment. 1.The procedure is same, the dose is also same as above group (i.e. 40ml) but the duration/course of the treatment is 4 to 5 weeks. 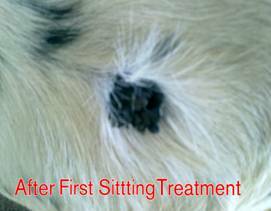 2.After fifth week of treatment you can seen the entire warts were sloughed off completely. For the Goats 20ml of raw blood was drawn and inject 10ml I/M and 10ml S/C. All we know that the causative agent for the warts is virus. 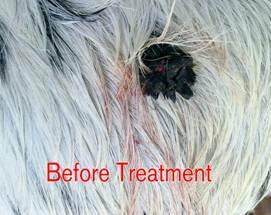 Taking serum (or) grinding of warts tissue for therapy is difficult procedure at field level. Hence I hope that this kind of treatment is very useful to field Vets.